As part of Art Journal Open’s ongoing efforts to actively solicit the opinions and thoughts of curators, archivists, librarians, researchers, and other cultural producers, we launched Conversations in the fall of 2014. The initial phase of this series was conducted between artists and curators, who revisited exhibitions they’d worked on together. This was a way to counter the emphasis that the art world places on openings and previews, and to explore the aftereffects of the exhibition process for both curators and artists. We began this round with a series of conversations by curator Dina Deitsch, in which she spoke with artists William Lamson, Kate Gilmore, and robbinschilds, all of whom she worked with on exhibitions during her tenure at the deCordova Sculpture Park and Museum. Subsequent conversations between curators and artists included curator Mia Locks with artist Math Bass (focused on the 2015 exhibition of Bass’s work that was curated by Locks, Math Bass: Off the Clock, at MoMA PS1 in Long Island City), and, most recently, curator Mika Yoshitake with artist Shana Lutker, which took place toward the close of Lutker’s solo exhibition, Shana Lutker: Le “NEW” Monocle, Chapters 1–3, at the Hirshhorn Museum and Sculpture Garden in Washington, DC. The next cohort focuses on the role of artist residencies, to clarify the vital role residencies play in artistic production and to examine the shifts in how they support artists. Those who organize these programs will interview artists who participate in them. These conversations will address how residencies operate—pragmatically providing artists with space and, at times, financial support—as well as detailing the ways residencies conceptually triangulate the dichotomy of the “academy” vs. the “gallery” as the two main spheres contemporary art discourse. We will be publishing conversations exploring both well-established organizations and newer programs. And in all cases, we will be hearing from a range of artists on their experiences before, during, and after their residencies. The first two conversations, Caitlin Masley-Charlet of Guttenberg Arts with artist Diana Shpungin and Vanessa Kauffman of Headlands Art Center for the Arts with artist Patricia Fernández Carcedo, can be read now, with more to appear in the coming months. 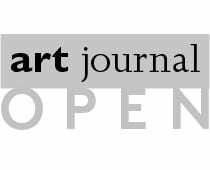 Art Journal Open welcomes proposals for conversations, artist’s projects, critical writing, and other contributions. Please see the submission guidelines here.